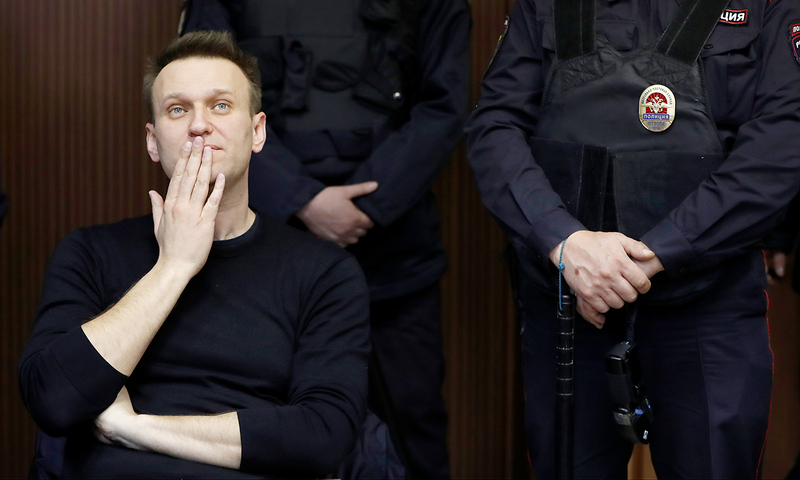 Russian opposition leader Alexei Navalny listens to a sentence in court in Moscow, Russia, March 30, 2017. The opposition politician does not enjoy huge popularity ratings in Russia, an opinion poll suggests. However, around 40 percent of the population support street protests. According to a recent survey conducted by the Levada Analytical Center, more than a third of Russians (38 percent) approve of the mass protests that raged through about 100 cities nationwide on March 26. However, 39 percent of people disapprove of the demonstrations spearheaded by opposition figure Alexey Navalny. Many of those questioned for the survey also don’t believe Navalny is someone worth rallying on the streets for. The results of the poll show that there were fewer Navalny supporters compared to those who joined the protests out of curiosity, or to keep friends company. The two main reasons people gave for marching were corruption and dissatisfaction with the authorities’ current political course. The survey also polled Russians about their attitude toward the authorities’ reaction to the protests, and their desire to see Navalny as the next president (he’s planning to run in the 2018 presidential election, even though criminal cases against him prohibits this). How will Russia's government respond to the people’s protests? Moscow police detained over 1,000 people on March 26, including journalists. This sparked public accusations of police brutality. Almost a third of the Levada Center poll respondents said the police went too far. As for Navalny's popularity rating, it remains rather low, despite the number of his overt supporters growing by three points from one to four percent in just one month, from January to February 2017. Pavel Salin, director of the Center for Political Studies at the Financial University, told RBTH that this spike in support is primarily explained by the fact that Navalny has managed to turn the tables against the authorities and become the leader of the negative agenda. Salin believes it was at that point that the Kremlin mounted a massive anti-Navalny campaign, which involved criminal inquiries into his previous business activity. As the result, the population was made to believe that Navalny is a criminal. Would you vote for Alexey Navalny in the next presidential elections?